Did you know we’ve been buying and restoring antiques and antique upholstery for over 40 years? Our experience ensures that we restore all our antiques sympathetically using time served methods. We have over 100 antique upholstered chairs, sofas and other interesting items held in stock. 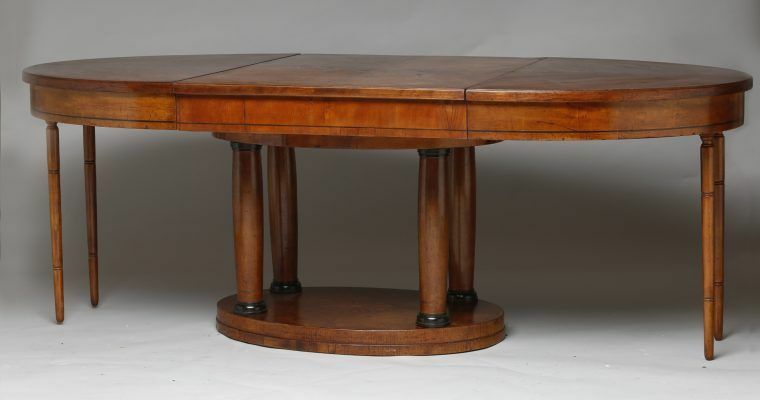 For example, as shown above and below, we have a wonderful 19th Century Satinwood table and ebony extendable dining table with inlay detail, seating 6-10 chairs. This table would look great with our Georgia Chair as shown here on the right. This is a generous dining chair with beautiful detailing and extremely softly upholstered. 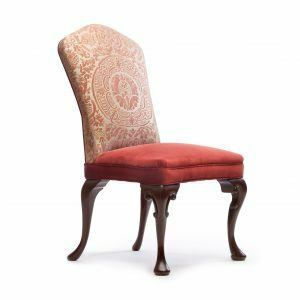 This chair has a distinctive hand carved Queen Anne leg and also has the option of a recessed pull handle for ease of movement. A lot of our antiques come with their original handles, panelled doors and intricate detailing work. 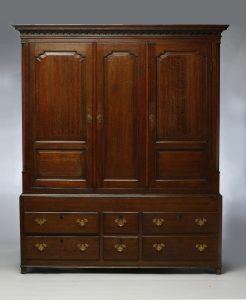 For example, we currently have a wonderful 18th Century Oak Housekeepers Cupboard with all of its original handles, dental cornice and raised panel doors. This fantastic antique would look great with our Gainsborough Armchair which has been based on an original period Gainsborough chair has a fully sprung seat, making this chair extremely comfortable. 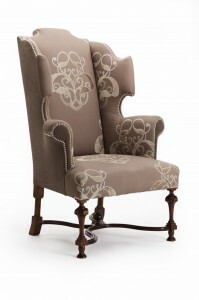 We currently have one of our Gainsborough Armchairs in our London showroom should you wish to view. 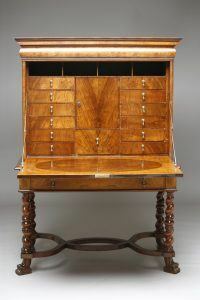 Amongst our classic antique pieces are some rare finds such as our 19th Century Walnut Escritoire on barley twist legs with crown cut inlay door (shown below). A beautiful piece which we feel would look great with our very special William & Mary Wing Chair which has been based on an original Wing Chair, circa 1760. The original chair had straw and hair stuffing, and today we still use loose teased hair to create superb comfort. 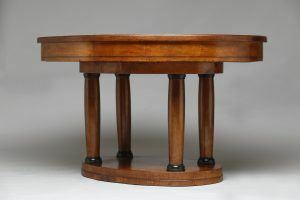 We also use European Walnut for the show wood and each leg, stretcher and centre finial is turned and carved by hand and lovingly French polished in our William and Mary finish. All our antiques are completely restored from the frame upwards using natural and organic materials. Our restored upholstery and our antique re-upholstery service includes traditional English jute webbing, hand tied individual copper cone springs, hessian, hair and wool wadding. Please telephone us on 01772 691777 for more information or if you would like to discuss any of our antique items.